Getting started with Teams? There are a couple of items to check first, but if you are already up and running with Obzervr, you can skim the next section and jump into creating Teams on Obzervr Manager. Your User has the correct Roles & Permissions! What roles and permissions will you need? Full Tenant Admin or Team Admin roles. You have configured Obzervr Manager i.e. you have created Users, Locations and Assignment Types. Open Obzervr Manager Web Portal. Navigate to Security and select Teams. Give the Team a Name, add a Description if you want (i.e. Groundwater Sampling) and add Users to the Team. Add an Assignment Type and Locations to the Team. These are required fields to create a Team. You can use the map to draw a polygon around an area to include all the Locations. 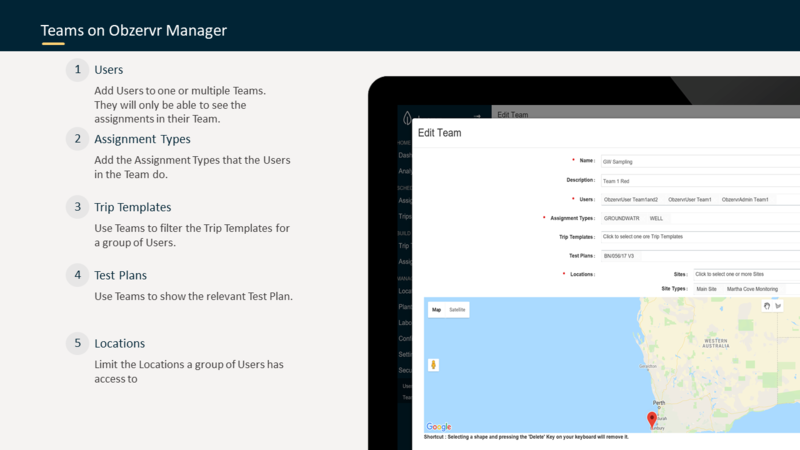 If you want, you can add Trip Templates and Test Plans required for Team. Click to Save. You have created a Team. The Team Name and Description will be displayed in Teams list. You have created a Team! Add yourself to the Team so you can see all the User’s Assignments and Trips. Test Plans will need to be added to the Team as well as the Assignment Type. Even if you only have one Test Plan, it will need to be added to each Team so that Capture Users can use the Test Plan to add samples. You can add Locations to the Team. When the Team is selected, only the relevant Assignment Points will show. You can also add Assignment Point Types to the Team. Using Assignment Point Types is another way to add a large group of Assignment Points to the Team. Not only will you see the Assignment Points you attach, but you will also be able to access any of the Assignment Points which have the Assignment Point Type that you have added to the Team. Wondering what Assignment Point Types are and why we use them? See more here: How to add more information to a location using Attributes.